On Moose Spotting in the Northeast Kingdom. We had just started heading north on VT 114 on the way out of the Kingdom town of Burke, when we spotted our first 1,000- pound antlered friend. 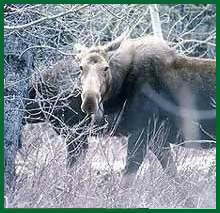 The moose stood knee-deep in a swampy brook along side the spruce-lined road enjoying a morning drink. For my clients it was the first time they had ever actually seen a moose first-hand, and I think, judging from their yells and hoots, they were rather impressed. I have seen many moose in the woods, and the last is always as impressive to me as the first. It was barely after 5 am and the mist hung low in the spruce bog. The rain had only called its quits a few minutes before. The young bull stood some 7 feet tall, his antlers still covered in velvet. We stopped the truck to get a better look at this majestic animal of the North Woods. He allowed us a short visit before trotting slowly off into the dense cluster of alders lining the edge of spruce and fir forest. The woman and her husband were obviously taken by the grandeur of the animal as they stood staring into the woods for several minutes where the moose last slipped out of sight. I suggested we head up the road because we were likely to see others. Mother Nature cooperated nicely this particular morning as we were to see two more. A young female, or cow as they are called, was courteous enough to parade across the road a few feet in front of my stopped truck. We all got a nice long look at her before she almost magically disappeared out of sight. A little later we headed down a dirt road that skirts a rather large bog nestled in at the base of a hardwood ridge. The sun hinted to us that it was about to sneak over the ridge into the morning sky. Here we were greeted by an enormous moose that wanted no part of us. She wasted no time in returning to the protective cover of the dark spruce forest. Moose are very active this time year alongside roads where they come to indulge in the sodium-rich licks that build up after a long winter of laying down road salt. Being crepuscular creatures, moose are most active at dawn and dusk. Your chances of encountering a moose in the Kingdom are very good - ask any local. Particularly good places are along VT 114 and VT 105, and Route 3 in New Hampshire north of West Stewartson. If you have never had the opportunity to see a moose, I strongly suggest you take advantage of this wonderful experience and head north. Young or old, it is not something you will soon forget. James Ehlers is a fly-fishing guide, a hunting guide, and career naturalist. He lives in Underhill, VT.